Serum cholesterol travels through the blood stream within lipoproteins, of which the two most abundant are low-density lipoprotein (LDL) known as “Bad Cholesterol” and high-density lipoprotein (HDL) known as “Good Cholesterol”. LDL carries cholesterol from the liver to peripheral tissues, while HDL carries cholesterol back to the liver for excretion or recycling. Determining the risk of cardiovascular disease (CVD) and CAD has traditionally included the measurement of a patient’s total cholesterol and HDL-cholesterol. These two numbers are then used to calculate the levels of LDL-cholesterol. Triglycerides are also measured. However, studies have found that more than 75% of patients with an acute coronary syndrome or myocardial infarction (heart attack) have normal blood values of cholesterol, LDL-cholesterol and HDL-cholesterol (2-4). Similarly, some individuals with elevated LDL-cholesterol do not develop heart disease. Patients and their physicians may not know their true risk of having a heart attack simply by measuring “good” and “bad” cholesterol, thus delaying appropriate preventative action because of this serious lack of information. In light of these findings a test was developed to assess the different lipoprotein fractions. The test has FDA approval and this test is now available in South Africa – referred to as the LipidPro test. 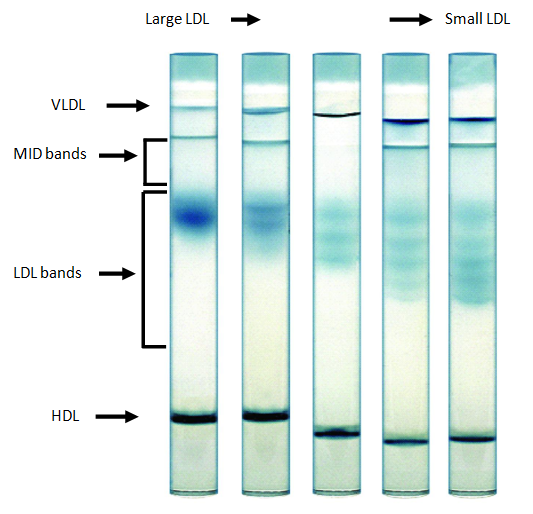 LipidPro analyzes all lipoprotein fractions and subfractions in an individual’s blood. LipidPro provides physicians with advanced and comprehensive lipoprotein analysis used for more specific screening and treatment decisions as well as for monitoring patients at increased risk for coronary heart disease (CHD). Learn more about LipidPro by clicking the tabs to the left to see how this advanced clinical information about cardiac health, provided by our test, could benefit you, your friends or your family. Castelli WP (1998). Cholesterol and lipids in the risk of coronary artery disease – The Framingham Heart Study. Can J Cariol; (Suppl A): 5A-10A. Castelli WP (1992). Epidemiology of triglycerides; a view from Framingham. Am J Cardiol; 70: 43-49. Catelli WP (1998). The new pathophysiology of coronary artery disease. Am J Cardiol; 82(Suppl 2): 60-85.